This Middle Eastern stew of a first novel suffers from an identity crisis. Does it want to be a blood-and-guts tale about factional strife and kidnapping in Lebanon, or a more cerebral examination of arms deals and statecraft in the Persian Gulf? The Lebanon part is straightforward. In 1973, a Maronite militia overlord is gunned down, along with his family and birthday party guests, by a revenge-seeking rival. Eighteen years later, the dead man’s brother, at the Beirut airport, kidnaps a man he wrongly believes to have been implicated in the massacre. Though the ransom demand is made early on, the swap happens only at novel’s end: goodbye, suspense. The kidnapee, Gaspar Bruyn, is the protégé of Bobo (Bertrand de Bossier), the French aristocrat who dominates the story. Bobo, France’s top spy in Lebanon masterminded the massacre to protect his relationship with the PLO; soon after, he became head of France’s intelligence outfit. He’s some guy, this Bobo. Among his achievements: he allowed the Ayatollah to return to Teheran, helped arrange the takeover of the US embassy, and “maneuvered” Saddam Hussein into attacking Iran. (Top that, George Smiley.) All this was done for the glory of France, though not for that dirty Red, Mitterand, or his Jewish advisers. When Mitterand fired him, Bobo became an arms dealer, supplying his top client Saddam (legally) and Saddam’s Iranian adversary (illegally). Playing both sides of the fence eventually caught up with him when, in 1988, he was “executed” by his mistress, Deadeye, on behalf of French intelligence. 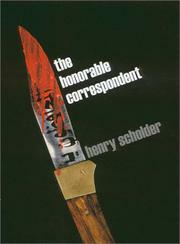 Scholder moves back and forth between the 1991 kidnapping and earlier time-frames and, inter alia, expatiates on France’s relations with the Arabs, the origins of Iran/Contra, and the Maronites’ ties to Israel’s Sharon; all this makes for a bumpy ride, worsened by clunky prose (“blood was the dominant substance on the lawn, red the prevailing color”). As crass as they come.